DocuClock is available for Serial or Parallel connection. The type you choose depends on the port(s) available on the computer to which the DocuClock will be connected. The most common connection is serial, but check your computer to be sure if you have the port available. 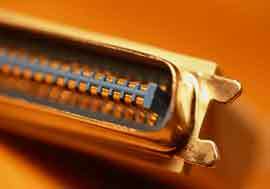 If you have a 9 pin male connector on the back of your computer, it is probably a serial port. If you have a 25 hole female connector, it is probably a parallel port. A serial port, or hardware interface, is one that transmits just 1 bit at at a time. Most serial ports on personal computers conform to the RS-232C (Short for recommended standard-232C, a standard interface approved by the Electronic Industries Association (EIA) for connecting serial devices.) standards. A serial port is a general-purpose interface that can be used for almost any type of device, including modems, mice, and printers (although most printers are connected to a parallel port). Serial port/cable interfaces for Windows-based computers usually have 9 pins (or sometimes 25 pins on older computers) and usually have the "male" end on the computer. The DocuClock Serial printers cable comes with a 9-pin "D-shell" cable with a female cable end. Parallel ports are able to transmit more than one bit at a time (that is, it receives several bits in parallel). Most modern printers are parallel. The DocuClock Parallel printers come with a cable with a Centronix connector for the printer end and a 25-pin "D-shell" male end for the computer. Converters are available at electronic and computer stores, if needed.